While in New Zealand recently I was able to attend part of a workshop held by Elizabeth Steiner at the ABC bindery at MOTAT (Auckland's Museum of Transport and Technology). The workshop made two Crossed Structure Bindings (CSB) using paper bags and because I only flew in on the evening of the first day, Elizabeth and the participants kindly allowed me to join them for the remainder of the class. I had brought my bone folder and a knife but apart from that I was empty handed so instead of paper bags I cut and folded old calendars into sections, and for my covers used an interestingly patterned piece of cardboard from an old avocado box. I didn't manage to finish in the remaining time because we had to pack up for the ABC (Association of Book Crafts) Annual General Meeting, which I think was only the second I've managed to be in NZ for in my 15 years of being a member. It was wonderful to see old friends and I really appreciate the ABC for the great support they give their members, even those overseas, like me. I did finish the book with Elizabeth's help and while it's not exactly a glamorous item, it is a good example of this particular style of CSB. 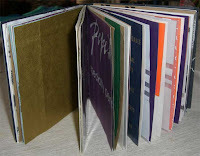 I think I first came across crossed structure bindings when staying with Barbara Schmelzer, a very experienced book binder, then based in Wellington New Zealand, and now in Sydney Australia. 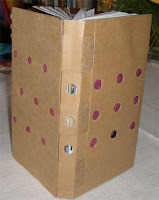 Barbara had made some very desirable paper bag books, and was only too happy to share this with me. Through Barbara, I also became aware of Carmencho Arregui, who developed the crossed structure binding (CSB), and I recommend her website for more information and instruction. 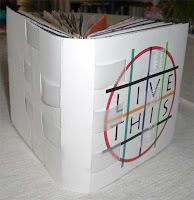 I made this book from some glitzy paper bags I'd been hoarding with the odd heavy quality plastic bag thro wn in, one in this case used as part of the binding. Some time later I decided to try the CSB on a book of photographs taken in New Zealand's beautiful Marlborough Sounds at the Portage Resort and combined them with examples of my marbling. 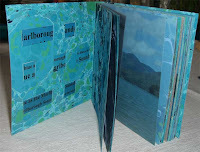 I called this Blue as the Marlborough Sounds and did some tricky placement of wording to almost get the name on the inside front binding strips. This book is mainly useful as an example of what I hope to master some day when I devote some seriou s time to CSB but at the moment I'm still dabbling. Beautiful, Carol!Don't s'pose you'd fancy doing a workshop up here? Thanks Tulibri and Aimee. These books are really fun to make. Moreidlethoughts, yes, I think I would fancy that. Thanks for the suggestion, we'll talk by email. The inside of the top one looks intriguing, too. Who would have thought such an interesting workshop took place inside MOTAT!! It looks closed more often than not. Well, good for them. Carol thank you so much for your comment.I was 57 yesterday! I felt old when I got dressed up to go out.. I am so glad to be back here on your wonderful blog. Now I have google reader I can add it. I've been before but I lost you! Great to see you posting again, and I love what you have made. I wish I could join in with some of those sessions! Congratulations on the new grand daughter. Mine is now crawling and pulling herself up, and trying very hard to talk! Carol, I was thinking about you last night as I read in the latest NZ Listener review on the Art Deco exhibition at NGV. In the first part of the dream you were explaining to the museum staff the merits of Pierre Legrain; in the second, you were packing your (?) car for a drive down to Melbourne. I don't know if you are going, but if you do, have a great time! What lovely books! You have such talent and wonderful ideas. Wish you could/would take time to really follow your dreams!! Yes, yes, so many books and so little time, I know that feeling well.. These are inspiring to see. Thanks for sharing them. 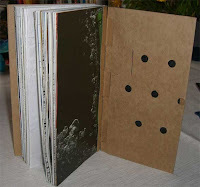 'm not familiar with the CSB term, though I have made one or two books that might fit. I admire your persistence in collecting suitable paper bags. I don't seem to come across anything suitable - maybe I don't SHOP enough. I'm absolutely fascinated with all these structures. I must have overlooked this post as I have been gone so much. This is a structure I am not familiar with. It is intriguing, I'm challenged to find out more about it! These are all lovely examples!